Nowadays, in our technologically advanced world, it is quite obvious that there is a high demand on data scientists. This role has become one of the most important and promising roles especially in the IT and technical line. A data scientist basically works with raw data using various tools and algorithms to solve critical data analytic problems. Thinking of starting a career in data science. Then these steps and article will get you started. Step 3: Learn from other experts in the field. Data science is one career that has long been foreseen as one that will trend in the future because of its impact in our daily lives. Some top career and professional websites like Glassdoor.com and Careercast.com rated data science as the No.1 best job in America for 2016. MyJobMag has also rated it, as one of the fastest growing jobs in Nigeria. As a result, persons have become interested in building a successful career in data science as a result of recent trends. Building a successful career in data science involves a lot which goes beyond interest. This article exposes all it takes to build a successful career in data science that goes beyond interest to actual achievement. We all hear about the term data science, but what does it really mean? 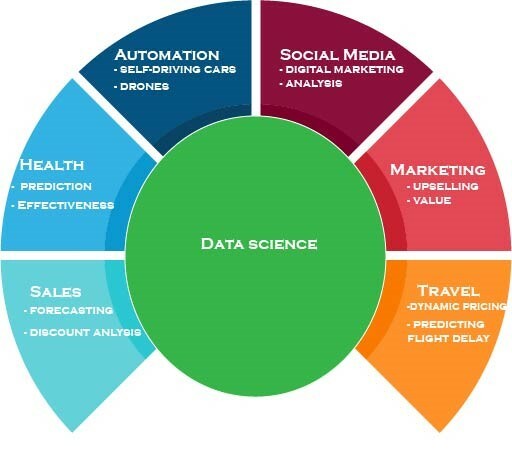 Data science is a broad field that refers to the collective processes, theories, concepts, tools and technologies that enable the review, analysis, and extraction of valuable knowledge and information from raw data. It is geared towards helping individuals and organizations make better decisions from stored, consumed and managed data. Data Science blends various tools. It makes use of algorithms and machine learning principles with the goal to discover hidden patterns from the raw data. While other experts take care of building software (which is used to collect data from multiple sources), coding models, and application of data collection tools and methods respectively, a data scientist takes care of collecting and storing data pulled in from several sources, analyzing and visualizing the data, and finally deriving insights from it. A data scientist spends a lot of time in the processing, cleaning, and munging data. This process requires persistence, statistics, and software engineering skills. Generally, experts generate data from different sources like financial logs, text files, multimedia forms, sensors, and instruments. Simple business intelligence tools are not capable of handling this large volume and variety of data that is why we need data science to help in the processing and analysis of these complex tools. Besides processing huge variety of data, there are still other functions and importance of data science in various domains. Below are some of the importance of data science. Precision: The data gathered over time can be used for predictions that will help in decisions making and will help provide better results. Now let’s take business as an example, imagine you can train models more effectively and recommend products to your customers with more precision. How direct and easy it has made business, because you will be able to understand the precise requirement of your customers. Decision Making: When you have a large variety of data, it can be used for decision making. Let us take a look at a basic scenario, imagine your car has the intelligence to drive you to work, won’t it be amazing? This is how it will work; the self-driving car collect data from sensors, radars, camera, and lasers to create a map of its surroundings. Based on this data, it makes decisions like when to slow down, when to speed up, when to overtake, where to turn to etc. making use of advanced machine learning algorithms. Predictive analysis: Data science can be used in the predictive analysis that will help predict events or occurrences to come. Looking at the importance of data science in predictive analysis like weather forecast, it is easy for us to appreciate the efforts of data scientist. Data from ships, aircraft, radars, satellites can be collected and analyzed to build models to forecast the weather and predict the occurrence of any natural disaster. Just like every other career, data science is one career that provides room for growth and development. Many persons think that starting a career in data science is all about being a data scientist, but there are other specializations. So if you are thinking of starting a career in data science, it is also important for you to get familiar with other areas in the field. Data Analysis is the art of collecting and analyzing data so that a company or companies can use the said data to perfect their marketing, insurance, political and business practices. The data analyst is a highly trained professional who sorts and organizes and runs various mathematical calculations to determine how the data samples might best be applied to profit the business. The typical duty of a data analyst is to; produce a report, spot patterns, collate data and set up infrastructures. Like we said earlier, the main aim of a data scientist is to use different tools and algorithms to solve problems. Problem solving and artificial intelligence is the goal of a machine learning engineer. Machine learning engineers are computer programmers, but their focus is beyond programming machines to perform specific tasks. They rather create programs that will enable the machine to perform a task without being specifically directed to perform those tasks. A good example of a system that a machine learning engineer would work on is a self-driving car. Machine learning engineers work on different applications that range from programming services to identifying specific needs and interests. They also customize news feeds and tailored web searches. Machine learning engineers contribute immensely to the daily lives of individuals and how they use technology. Data engineering is another specialized career in data science. Data engineers are the designers, builders, and managers of “big data” infrastructure. They develop the framework or architecture that helps to analyze and process data. A data engineer is an engineer that specializes in building data pipelines to pull information from different source systems. A data engineer integrates, consolidates, cleanse and structure data for individual analytics applications. A good data engineer should have a good experience in software engineering. Big data engineers should also have the capability to architect highly scalable distributed systems, using different open source tools. A data science generalist focuses on using big data and algorithms to solve problems. The main job of a data science generalist is to experiment with the latest algorithms and statistics to find the best way to solve a data science problem. Some of the most important data generalist skills are; familiarity with tools designed for ‘big data,’ and an experience in real-life datasets. As the no.1 career in 2016, it is not uncommon for many persons to become interested in data science. With the dire importance of data scientist in today’s technology-driven world, many persons will be curious to find out how much they earn performing such an important role in business and technology. Below are the estimated average salaries of data scientist according to their field of specialization and expertise. Based on the research done by Myjobmag.com on this article, it is important to note that the salaries given below are estimated average salaries gotten from research and online platforms like MySalaryScale.com, Glassdoor.com, Payscale.com etc. Data analysts averagely earn between ₦1,000,000- ₦ 1,600,000 annually in Nigeria. The average salary for a data science generalist is $112,000 per year, it ranges from $91,000 – $144,000 per year. To become a successful data scientist, there are some required skills and qualifications that you will need to acquire to become a qualified and certified data scientist. For entry-level jobs, candidates will need to acquire a bachelor degree in math, statistics, computer science, information management, finance or economics. To be skillful, getting a master degree or graduate certificate in related field will be more advantageous. Interested in learning data scienc. Maybe you just want to get a fill of the industry and if it is right for you? Then use this top 10 online platform to get to learn data science for free. Like any field, the world of Data science changes very rapidly. Here are the top 10 data scientist to follow on twitter for up to date news, tips and helpful information in the data science world. The next step to take after acquiring a data science degree or skill is to put your skill in real life practice by securing a job. It is important to note that getting a skill is not enough when searching for a job. Have a portfolio: If you are looking for a serious paid job in data science, then it is time for you to have your portfolio. Having a portfolio makes it easy for people to access your works in an organized manner. It is important for you to do some projects with real data and post them on relevant online platforms. Join LinkedIn: LinkedIn is good career network platform that allows different professionals to share ideas. Joining a LinkedIn group allows you connect and network with professionals in your field who will be of great help to your career. LinkedIn.com also allows you to search for jobs in your field. You can Search for data science jobs, then apply for the jobs. Your connections can refer you to an employer if they are impressed. Have a Good CV: Your CV is your marketing tool. A good CV that showcases your skill and ability will bring you a step forward in landing your dream job. If you are just starting your career journey in data science then your CV is important too, because it is what recruiters will get to see first before you can even be invited for a job interview. Writing a CV may seem confusing for a new graduate, but it could be easier with Myjobmag.com CV services. 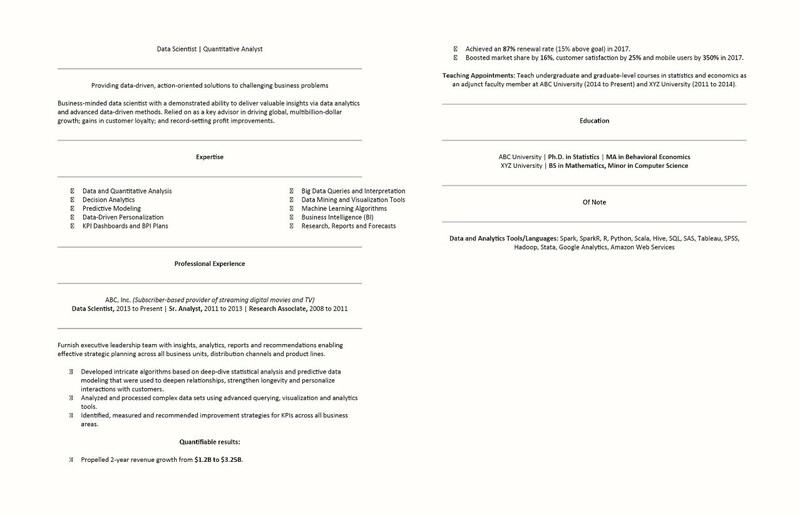 See CV template below to guide you. Another great step to take to become a successful data scientist is to search and apply for jobs related to your field. If you have all the skill and qualification needed for the role, and you don’t apply it is almost as good as not having it at all. Applying for a job opening is important because you are giving yourself the opportunity to practice the skills you have gathered over time to solve real life problems. If you are qualified and skilled for a particular position, then it is time for you to go ahead and search for job openings in that field and apply. Although job hunting for fresh graduates could seem really challenging, there are easy ways to search for jobs. Instead of randomly searching for jobs, there are online job posting sites that make it really easy for a data scientist to search and apply for jobs based on their field.